We will try to resolve the situation or answer your question within 24 hours. 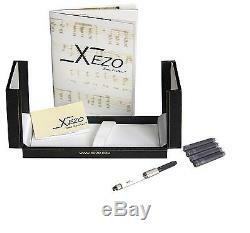 We are an authorized internet dealer for Xezo designer brand. PLEASE NOTE THAT THE SERIAL NUMBER ON THE PRODUCT YOU WILL RECEIVE WILL BE DIFFERENT FROM THE SERIAL NUMBER SHOWN IN THESE PICTURES. 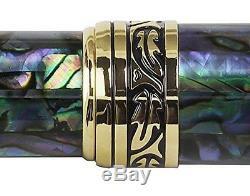 Weight-balanced Natural New Zealand Sea-Shell (Abalone) and 18K gold-plated hallmarked luxury brass pen; No two of these limited and serialized handcrafted pens are alike. 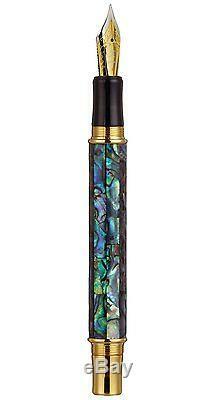 Distinctions and variations occur in natural sea shell, and those only add to the beauty and uniqueness of each of these handcrafted pens; Colors range from forest to black, with red/blue overtones. 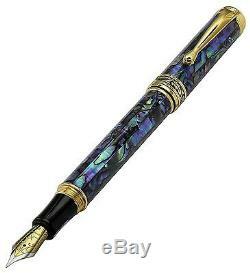 With this edition, more blue toned shells were chosen to showcase their oceanic origins and the band features an etched leaf design; Layers of clear lacquer add protection to the surface of the pen. German-made iridium Fine point stainless steel gold-plated nib, and the ink refill selectively interchangeable with many common refills like visconti, montblanc, schmidt, and waterman. 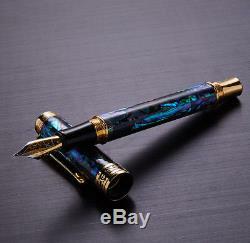 The fountain pen features a slimmer barrel than its predecessor, and a uniquely developed technique of applying the sea shell mosaic on the body of the pen. The Maestro Series fountain pens were produced in limited editions and are individually numbered. It has a German-made Fine point stainless steel nib and screw-on cap. The overall design concept of these pens utilizes Art Nouveau style and follows the natural colors and shapes of the sea shell material. Imagine holding an object polished to perfection and made of precious, glowing, iridescent natural sea shell that shimmers in the light as it moves. What would be the point, if not to be used though? So to protect the finish, layer upon layer of clear lacquer are manually applied and polished by hand. The sea shell panels range from green to black, along with red or blue overtones. No two pens are exactly alike. Due to the slight difference in weight of each of the sea shell panels involved in the production of these pens, the weight of each pen will vary slightly. Sea shells are natural materials; therefore, some distinctions in the texture of these materials may occur. These distinctions and variations in texture are not defects, but rather natural attributes which add beauty and uniqueness to each of these pens. This is truly a treasured gift to remember, for someone special, or yourself! 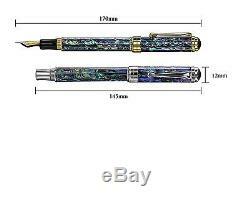 The item "Xezo Natural New Zealand Paua Sea Shell Fountain Pen. 851275007061" is in sale since Friday, July 20, 2018. 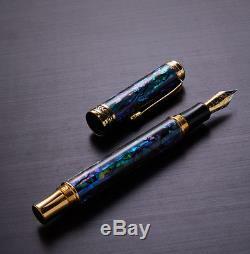 This item is in the category "Collectibles\Pens & Writing Instruments\Pens\Fountain Pens\Visconti". The seller is "xezonline" and is located in Eugene, Oregon. This item can be shipped to North, South, or Latin America, all countries in Europe, all countries in continental Asia, Australia, South africa, New Zealand.